Rough Prototypes are low-fidelity prototypes such as sketches and mock-ups that help envisioning, communicating and testing a design idea. In software design they are usually made with paper (paper prototyping) but it is often quite useful to have access to other objects and materials as they could help stimulating new ideas. Base on my previous experience in designing toys with children using recycling materials, I started organising design workshops using recycled materials. To make professionals use recycling materials such as plastic bottles, cans, boxes and so on, it is really important to make the material ‘ready’ by cutting them into pieces and make sure everything is clean. This methodology has been inspired by Bruno Munari way of running workshop with children and it shows to be really powerful. 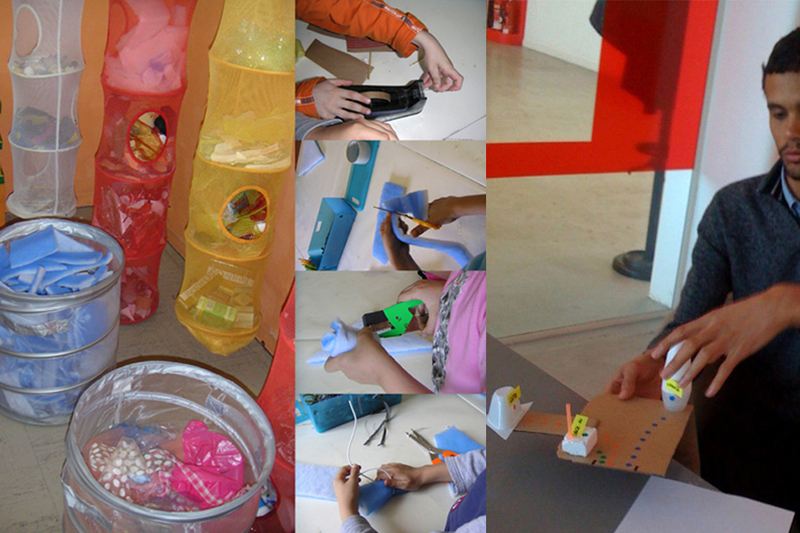 Ideas are developed quickly and participants really enjoy the experience of making thing with their own hands. Rough prototypes allow people to visualise their ideas and gather feedback from others. It also helps making the process of design more tangible. Kim Goodwin, Designing for the Digital Age: How to Create Human-centered Products and Services, John Wiley & Sons, 2009.